Esta página ou seção está incompleta. Você pode ajudar adicionando conteúdo a ela. Para mais informações, veja os arquivos de ajuda, o guia de estilo, e a página de discussão deste artigo. Mercator Hosidus, an Imperial noble, handles appointments for Count Janus Hassildor at the Skingrad Castle. It seems he moonlights in another profession, however. During the related quest, Mercator turns out to be a Necromancer and attempts to lure the player into an ambush together with his two similar minded friends: Arterion and Mondrar Henim. 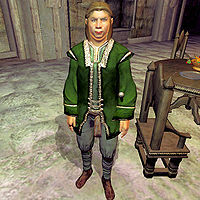 He will also point you towards Shum gro-Yarug if you ask him about buying a house in Skingrad. At the castle, Mercator shares his duties with Hal-Liurz, but is clearly the more arrogant of the two. Even though he hides a dark secret, he lives his life at ease. Every day at 6am, he gets out of his bed in the Castle Living Quarters and enters the County Hall, where he will wander around all day long. As the count never wants to see anybody, his job is extremely easy; therefore, as early as 8pm, Mercator retires to his room for ten hours of sleep. The only exception to this routine is at stage 30 of the related quest, when he will set off at 10pm to the high pastures, just west of Tamika's Vineyard and wait for you to make your appearance. He wears typical upper-class attire: a green brocade doublet, a green silk garment and a pair of matching shoes. He also carries a leveled piece of upper-class jewelry, a sizable amount of gold and two keys, which are however removed from his inventory at the start of the related quest. In combat, he relies on an Iron Dagger and leveled set of standard Necromancer spells. His room is located in the midst of the Castle's Living Quarters and contains a few items not suitable for a steward, two books on Alchemy and a complete set of Alchemy Apparatus. Not the most polite steward in the game, he will greet you with the following insult: "The Count will not see you now. Not now, not ever. He sees no one. I'm Mercator Hosidus, his steward. I believe that's all you need to know." On the city of Skingrad, he will give the following impolite advice: "Wander the streets, fields, and public places of Skingrad to your heart's content. Just don't include me in your social explorations." During the Ulterior Motives quest, nearly anyone asked about the Count will point you to Mercator: "All appointments to see the Count must go through Mercator Hosidus" and "He's the person to talk to about an audience with the Count. You'll find him in the County Hall.". Hal-Liurz will confirm that: "I'm afraid that's not my arena. You'll have to speak to Mercator about seeing the Count." Mercator will be just as impolite as ever: "Yes, the Mages Guild, you say? Oh, the Count is quite aware of your presence here. He simply has no interest in granting you an audience at this time. Now that I've seen you myself, I can't say that I blame him. Nevertheless, I shall endeavor to change his mind on the subject. Return tomorrow - perhaps he will see you then." When you return the next day, he will start his little scheme to get rid of you: "You there. I have an update for you. The Count has agreed to see you, but not here. He wishes to meet with you north of the Cursed Mine outside of town, after 2 AM. It would be wise of you to be on time. Follow the road west out of Skingrad, through the High Pasture. The mine entrance is south of the road. The Count will meet you just outside it." If you speak with him again he will repeat his instruction: "I've told you all you need to know. Follow the road west out of town and through the High Pasture; the Count will meet you there at 2 AM." When you meet him and his three companions outside town, he will reveal his true identity and plans. If you are early to the meeting he will say: "Well, well. You're early, Mage. I'm afraid I mislead you." If you arrive between 2AM and when he leaves, he will instead say: "Just in time, Mage. We've been waiting for you." He will then proceed: "The Count won't be arriving – in fact, he doesn't even know you're here. We're not about to let the Guild interfere with our plans, for the Count or otherwise. So, you'll have to die. Don't worry. We'll put your body to good use, I assure you." After this, he and his fellow Necromancers will proceed to attack you, with the inevitable result. Once he is dead, Count Hassildor will shout: "You impossible fool. What possessed you to think I would suggest a meeting here, of all places? At least your gullibility served some useful purpose. I knew about Mercator, but not his friends. Now none of them are a threat any longer." If you state your puzzlement he won't be impressed: "Do you not recognize a Necromancer when you see one? I suspected Mercator was involved in their cult, but was unwilling to move against him without knowing the identities of his allies." After the quest, puzzled citizens may say: "Do you know what happened to Mercator Hosidus? I haven't seen him at the castle lately." Attacking Mercator at the meeting before speaking to him will count as an assault and will give you the relevant bounty. When being directed to the location of the meeting for stage 30 of the quest, you are told "He wishes to meet with you north of the Cursed Mine outside of town, after 2 AM." except the meeting location is actually south of the mine. Both the audio and subtitle are incorrect. Esta página foi modificada pela última vez à(s) 05h36min de 20 de outubro de 2015.